Histomorphometry of the knee joint is the standard method for assessing osteoarthritis (OA) in experimental mice. For routine staining, joints are fixed in 10% formalin (NBF) for 24 hours then demineralized in 20% ethylenediaminetetraacetic acid (EDTA) for 7 days. This allows for paraffin embedded sectioning of the bone. It is also possible to decalcify with a 48 hour treatment in 10% formic acid, but this is generally avoided because of the higher risk of denaturing proteoglycans. If the mice were injected with fluorochromes (e.g. 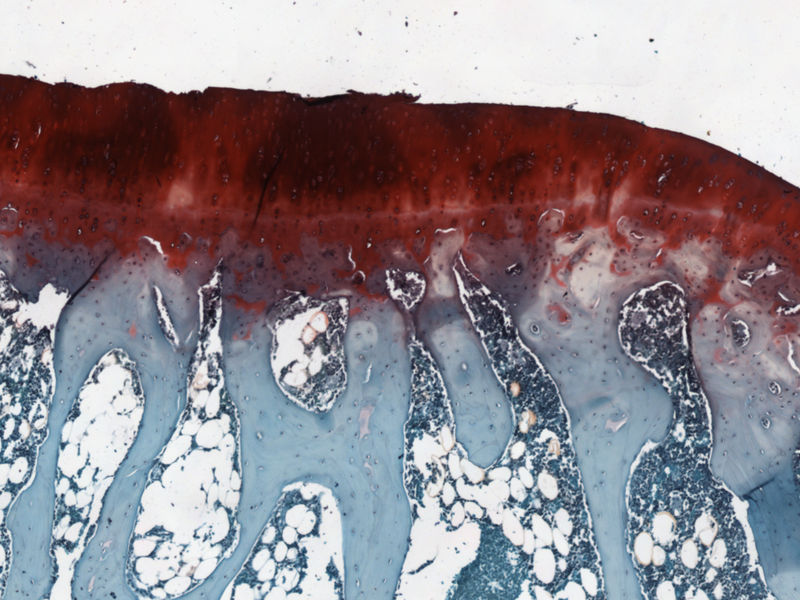 calcein or alizarine red) to measure the rate of bone formation the histology protocol must be modified. Demineralization is not possible as it leaches out the fluorochromes along with the calcium. Such samples should be fixed in 10% NBF and transferred promptly to 70% ethanol for storage. Overfixation can cause the fluorochromes to fade. To section non-decalcified bone, joints can be frozen and cut on a cryostat or embedded in methyl methacrylate resin (MMA) and cut on a motorized microtome. For immunohistochemical staining, fixation in 4% paraformaldehyde may be preferred to maintain antigenicity. Regardless of the embedding protocol, the preferred sectioning orientation is frontal rather than sagittal because (1) frontal sectioning allows for the medial and lateral sides of the joint to be analyzed in the same image and (2) fewer sections are required to evaluate the entire joint. There are two techniques to quantify proteoglycan loss in histology. The most straight-forward method is to quantify the percent of the cartilage that is "strongly stained" for proteoglycans. If additional care is taken, the quantity of stained proteoglycans can be quantified using optical density data of the safranin-o staining. BIOQUANT has a specialized tool to rapidly quantify the surface length of structures. Structures can be defined automatically by color thresholding or manually with a brush. The basis for the Osteoarthritis Research Society International (OARSI ) score is the percentage of articular surface which is eroded or marked by clefts down to the calcified cartilage. The articular surface is, by definition, no longer present. Several strategies exist to address this issue. The most simple is for the technician to simply draw a line reconstructing the lost articular surface. Alternatively, the software can use the existing cartilage and reconstruct the likely articular surface. BIOQUANT has several unique tools to help you define tissue volumes quickly and consistently. The Irregular TV tool makes it easy to define the outer “epiphyseal tissue volume” containing all the bone distal to the articular cartilage and proximal of the growth plate, including the cortical shell. FYI - The Referent Data Tool can be used on a large scan of the tissue, zoomed out to fit in the Image window as show above. It can also be used field-to-field at higher magnification. You do not need a scan or tracking device to use BIOQUANT, although they do save you time. Second, a “trabecular tissue volume” is drawn that contains only epiphyseal trabecular bone, excluding the cortical shell, subchondral bone plate, and bone proximal to the growth plate. Finally, BIOQUANT uses a specialized tool to measure the structure of the subchondral bone plate. Thickening of this plate is often associated with loss of articular cartilage. TNF-α plays a key role in the development of rheumatoid arthritis (RA) and inflammatory bone loss. Unfortunately, treatment of RA with anti-inflammatory glucocorticoids (GCs) also causes bone loss resulting in osteoporosis. Our previous studies showed that overexpression of glucocorticoid-induced leucine zipper (GILZ), a mediator of GC’s anti-inflammatory effect, can enhance osteogenic differentiation in vitro and bone acquisition in vivo. The anti-rheumatic efficacy of grape powder (GP) diet was evaluated in transgenic mice (TG) overexpressing human tumor necrosis factor (TNF), a model for rheumatoid arthritis (RA). After 4-weeks, TG mice fed on 10% of GP showed improvement with epiphyseal bone mass (p = 0.07) compared to TG fed on a regular diet. TG mice that received 5 or 10% of GP exhibited a significant (p < 0.05) decrease in resorption-associated osteoclasts in paw and knee joints. Osteoarthritis (OA) is the most common joint disease, characterized by progressive destruction of the articular cartilage. The surface of joint cartilage is the first defensive and affected site of OA, but our knowledge of genesis and homeostasis of this superficial zone is scarce. EGFR signaling is important for tissue homeostasis. Cytosolic DNA sensors detect microbial DNA and promote type I interferon and pro-inflammatory cytokine production through the adaptor stimulator of interferon genes (STING) to resolve infection. Endogenous DNA also engages the STING pathway, contributing to autoimmune disease. Osteoporosis (OP) and osteoarthritis (OA) are the most common joint diseases, with a high incidence in the elderly population. OP is characterized by trabecular bone remodeling and reabsorption, whereas articular cartilage and subchondral bone remodeling are major features of OA.